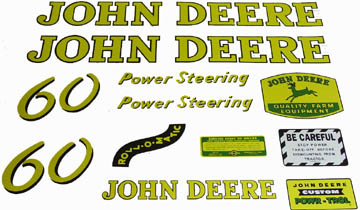 Our Mylar John Deere decals are still manufactured the old fashioned way. We start with a clear sheet of mylar decal film and then silk screen the letters on to the mylar film. This is the same process used to make decals years ago when your tractor was new. When applied to the tractor the clear film stays with the lettering. Mylar decals are an excellent choice for cost conscious customers who still want more than just a generic sticker kit. Call for decals not listed. We offer decals in complete sets only.